Our English courses in Vancouver start every Monday. Before starting school on Monday our Sunday experience is a great way to make friends. The group discovers downtown and goes for lunch together. We start at the main entrance of the school and walk to the second entrance, the fire stairs, which our students can use to go up to the second and third floor. From there we walk to Dollarama and Phone Box. Dollarama is a great option for people on a budget because everything in the store ranges from $1-$4. They sell office products, snacks and materials to do crafts as well as gift supplies. Next to Dollarama is Phone Box where you can get a sim card for your phone. Our Sunday experience continues to Scotiabank, London Drugs and the Vancouver City Centre Station for Canada Line. Scotiabank has good ATM where you can safely withdraw money as well as exchange your currency for Canadian Dollars. London Drugs is a pharmacy/ drug store where you can purchase medicine and snacks on the top floor and electronics in the basement. This is where you can buy an adapter for your charger. Vancouver City Centre Station is the closest station to the school for those who live in Richmond and have to take Canada Line. 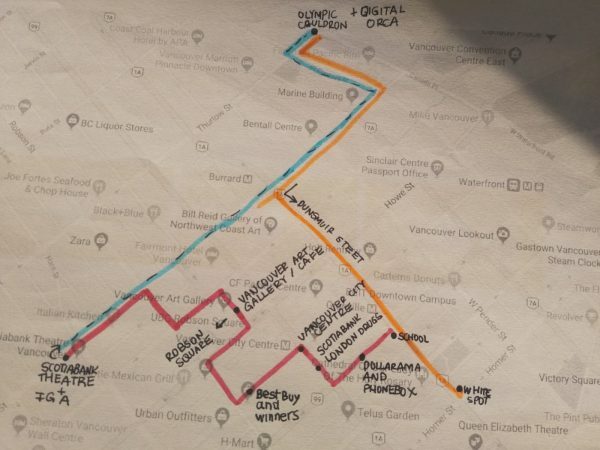 From there the Sunday experience takes us to Best Buy, Winners, the Pacific Centre and Granville Street. Best Buy is an electronics store that carries a lot of products such as phones or cameras. On top of Best Buy is Winners where you can purchase cheap clothing items. The Pacific Centre is the closest mall to the school and has a lot of different stores for all kinds of needs. There you can also find kiosks where you can get a sim card from different phone companies. Granville Street is good to go out partying because there are a lot of clubs and bars. The next stops of our Sunday experience are the Vancouver Art Gallery, the Gallery Café and Robson Square. The Vancouver Art gallery is a beautiful place to visit with rotating exhibitions. The best day to go to the museum is on Tuesday because that is when it is by donations which means you can pay as much or a little as you think they deserve. The Gallery Café is the café of the museum. They serve really nice brunch and their patio is very nice to sit on and have a drink. In winter time Robson Square is an ice rink where you can rent your skates and ice skate for free for as long as you want. Then the Sunday experience takes us to the Scotiabank Theatre and IGA. The Scotiabank Theatre is the cinema of choice in downtown Vancouver. Just like the Art Gallery the Theatre is cheaper on Tuesdays. IGA is the closest supermarket to the school. If you live in APT or VIVA tower or you just have to prepare your own meals, this is a good supermarket for you to buy your own groceries. But there are probably a few supermarkets around your residence as well. Before going to the restaurant our Sunday experience stops at the 2010 Olympic Cauldron, the Digital Orca and the seaplanes. The Olympic Cauldron is from the 2010 winter Olympics which were hosted in Vancouver. After looking at the Digital Orca, Stanley Park, the seaplanes, the mountains and the water, we are going back to school and having lunch with whoever wants to join.